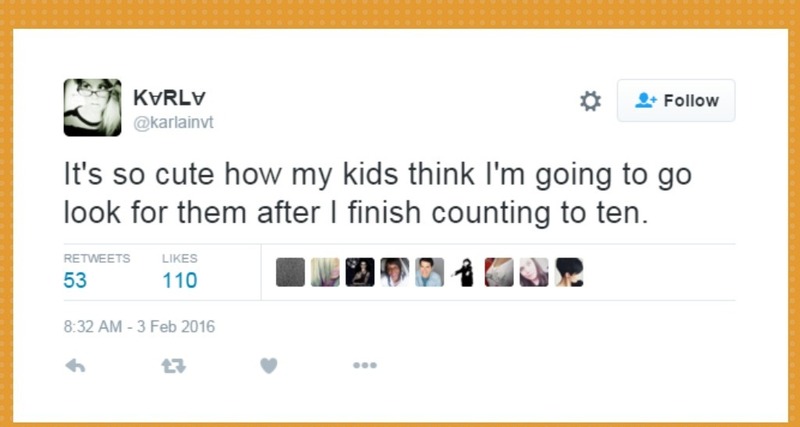 From kids sticking Goldfish up their noses to forgetting to look for the little ones during a game of hide-and-seek, here are the 10 best parenting tweets from this week. "Dad who is you favorite kid?" ~ My least favorite kid asked me today. Mom 2: My son is vegan. Me: My son sticks goldfish crackers up his nose. It's so cute how my kids think I'm going to go look for them after I finish counting to ten. Kids teach us so much. Like, how to yell through clenched teeth and how to give up completely on our dreams. I'm sorry I'm late. My baby had eighty-five snaps on her suit. Now that my son just hit 14 years old, he's super excited because we're finally letting him sit frontwards in his car seat.